We take a look at a classic look: the pageboy bob. The pageboy bob is a classic cut that was the height of fashion in the Roaring Twenties. Its blunt lines and short length suited the androgynous look that was in vogue at the time, and were a welcome departure from the stuffy, over-styled Edwardian looks that were in fashion from 1900-1919.Â To this day, the pageboy bob evokes a sense of glamour and elegance, not to mention a little bit of rebellion!Â The Flappers who made this look famous were all about breaking convention--cutting their hair, shortening their hemlines, flaunting boyish silhouettes and partying like it was, well, the 1920s! These days, pageboy bobs still carry that chic, elegant yet edgy vibe, all while retaining a timeless sense of style. Since the pageboy bob is a bold cut, those who wear it should definitely be confident in their skin. This hairstyle also requires a certain dress sense to pull it off. Pageboys bobs can look unflattering or juvenile if they aren't accompanied by a chic and sophisticated sense of style. Think Anna Wintour, Coco Rocha and Mary J. Blige for inspiration. These ladies have all worn the pageboy bob and killed it, thanks to their immaculate fashion sense and unique personalities. Coco Rocha looks flawless in this cheek-length pageboy bob that gives her a timeless, gorgeous look. Coco has a high forehead and a square, angular face which doesn't make her an ideal candidate for this cut, but she makes it work for her by going for a rounded silhouette and long bangs that have been softened around the edges. The cheekbone length is ideal for her face shape too as it pulls the focus from her square jawline and gives her face a more oval shape. To compare, we can see that when her bob grows out to jaw length her face looks much more angular and her jaw line becomes more pronounced. If you have angles or a square face shape like Coco, go for an ultra-short bob like the one above, or a longer version that falls past the shoulders for best results. Mary J Blige rocks a blonde pageboy bob here with fabulous results. 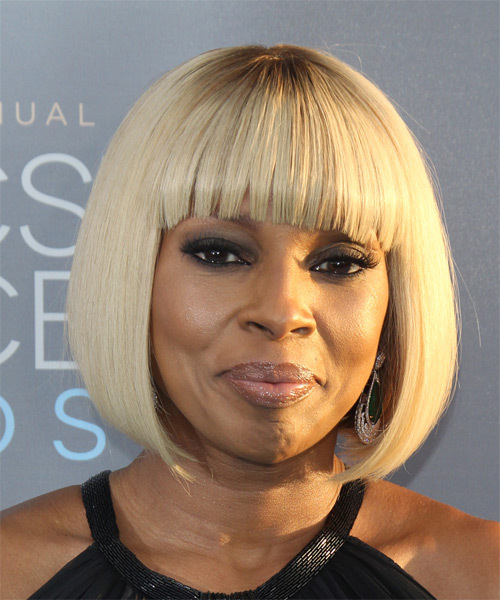 The chin length of this cut suits Mary J's oval face shape nicely while the fringe brings attention to her eyes. Her straight locks have been sculpted into a rounded shape for a soft finish, while her fringe has been arched slightly for a flattering look. This bob would've looked stunning in a dark brown or black color but the blonde gives it a fresh, youthful update, plus it looks gorgeous with Mary J's skin tone and dark eyes. 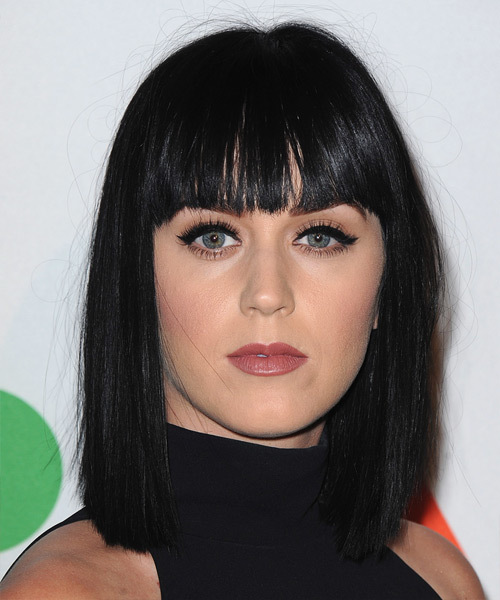 Katy Perry goes for a longer version of the pageboy bob here, which is a good option for ladies with square face shapes, angular jaw lines, or for those with some wave in their hair. This shoulder length cut has a longer fringe to help soften angles and can balance out face shapes that are more wide than tall. It works well for straight hair as well as wavy hair that may not sit well in shorter pageboy styles. Style chameleon Rihanna can pull off pretty much any hairstyle and color. This pageboy bob is an excellent choice for her oval face shape because it hides her high forehead and brings all of the attention to her stunning facial features. She has chosen a jaw length bob which gives her straight hair some nice swing at the ends. Her black, glossy color is showcased by this striking haircut, making it one of her best looks. Victoria Summer channels the Roaring Twenties here with her ultra short pageboy bob and baby bangs. 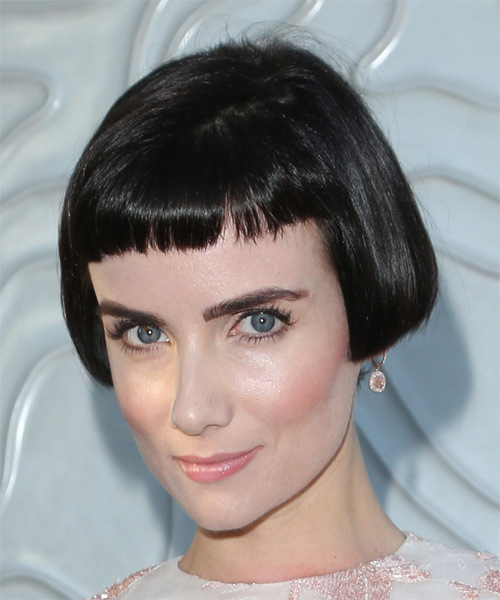 Paired up with her dark locks, fair skin and huge blue eyes, this haircut makes Victoria look like a living doll. This version of the pageboy bob is perfect for ladies with an oval face shape who like to project a vintage look. This haircut looks fabulous with an androgynous fashion sense, but can also match a super vintage, feminine sense of style as well. Ana Faris shows us how to flaunt a pageboy bob with fine hair. The blunt edges of the hair and bangs create a thicker look and paired with this baby blonde color, give Ana's hair a soft and feminine finish. Ana has a high forehead so her bangs start at the top of the head to create a thick, long fringe with her fine hair. Garcelle Beauvais looks stunning here in a graduated pageboy bob and eye-skimming fringe. This version of the pageboy is ideal for for her strong jawline and high forehead. The long, layered cut has been sculpted into a smooth, rounded shape with the front being left slightly longer for a chic finish.Â Her raven black locks look shiny and healthy thanks to this cut and her silky straight hair texture. 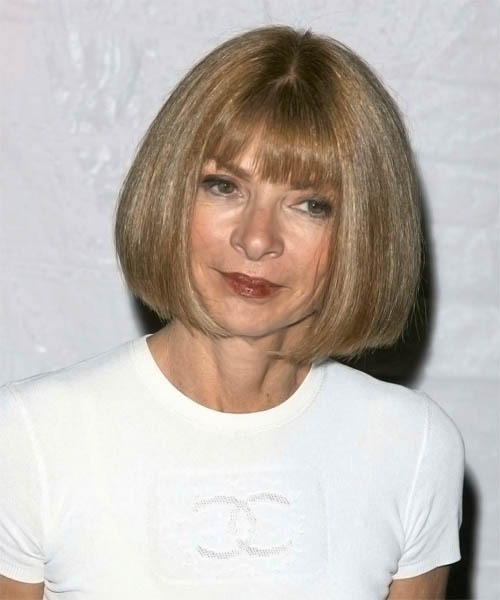 Anna Wintour has been sporting this hairstyle for decades with flair. Anna has a low forehead so she has modified her bob to have a thin fringe at the front that sits at her eyebrows. The blunt ends of her haircut and the jaw length of this 'do give her locks a thick and healthy appearance. Her golden blonde color looks fabulous paired up with this pageboy bob too.